BitTorrent , the peer-to-peer file sharing network, is to open a legal video download store, due to go live today. 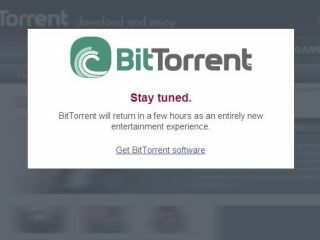 The BitTorrent Entertainment Network (BTEN) will offer paid-for downloads of movies, TV shows, video games, and other media. The store will start off with some 5,000 titles in its collection. BitTorrent has signed deals with numerous content providers, including 20th Century Fox , Paramount Pictures , Warner Bros , Lions Gate , and MGM , who will offer some 3,000 new and classic movies. Movies will be available for rental only, and will cost $3 for older titles, or $4 for newer ones. Downloads expire after either 30 days, or 24 hours from when viewing begins. BitTorrent Entertainment Network users will be able to keep other types of downloaded content such as TV shows and music videos for $2 a pop, as well as PC games. Paid-for downloads will be displayed alongside free content, much of it unauthorised, already offered by BitTorrent. The downloads play in Microsoft's Windows Media Player 11 and will be protected by Microsoft DRM, which means Mac and Linux users won't be able to use the service. Bram Cohen, CEO of BitTorrent, told the New York TImes the company was "not happy with the user interface implications. It's an unfortunate thing. We would really like to strip it all away." The newspaper also reported that download speeds using BTEN are faster than rival services. Downloading the X-Men 3 movie from Walmart's Video Downloads Store took three hours, whilst BTEN managed it in just two hours. It should also theoretically become faster as more users sign up to the service. BitTorrent's open-source distribution technology, introduced in 2001, allows a single file to be broken up into small fragments that are distributed among computers and shared among users. BitTorrent's new service pits the company against rival legal download services such as Apple's iTunes Store , Microsoft's Xbox Live service , Brightcove , Amazon Unbox , and Joost , who recently signed a deal with media giant Viacom. The company has long tried to make itself more acceptable to a mainstream audience. Last May, the company teamed up with Warner Bros to distribute its films, which won BitTorrent a certain measure of respectability. Michael McGuire, vice president at research firm Gartner , said BitTorrent and its rivals all face the same challenge: "They must get consumers to look at this as a better and more reliable way to watch a movie than renting a DVD."